Invasive plants have been a source of frustration to Canadians for decades. These species pose a threat to our environment by “choking out” native plants and decreasing biodiversity, and are a threat to our economy. The federal government estimates that invasive species cost us about $30 billion annually (research, monitoring, management, and removal). They affect every part of our daily lives from agriculture (reduced yields and lost markets, increased pest control costs) to human health (hay fever and allergies), often without us realizing it. These plants cost our agriculture industry between $5.3 and $13.9 billion every year. Native species being pushed to the brink of extinction is disrupting the food chain, as local animals that rely on these plants lose their food source. If that isn’t bad enough, some invasive species like giant hogweed can be directly harmful to people. These plants have sap that contains toxins that can cause severe chemical burns when touched. So invasive plants are obviously a problem, but what is it that makes these plants invasive? What factors influence a species’ ‘invasiveness’? 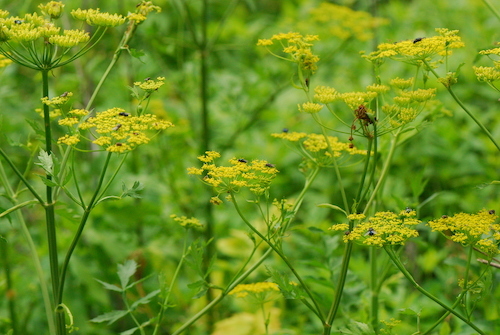 In 2008, the Canadian Food Inspection Agency published a summary report that identified 486 weedy or invasive plant species—species that cause harm to native ecosystems—out of a total of 1229 non-native species in Canada. When looking at the factors that make a plant species invasive, there’s a lot to consider. Some of the traits often mentioned are lack of natural predators in the new habitat, rapid growth that allows the plants to mature quickly, and increased seed production. Some or all of these traits are often found together. Numerous papers show that invasiveness stems from a cocktail of complementary traits. But not every trait is advantageous in every environment. This is why the same plant may be invasive in some habitats but not in others—like the Monterey Pine, which is rare in its native North America, but considered invasive in some areas of the southern hemisphere. Three traits are becoming more widely recognized as contributing to plant invasiveness: allelopathy, phenotypic plasticity, and germination strategy. Allelopathy is the ability of a plant to suppress the growth of other plants around it, which helps it to both establish itself and persevere in a new area. 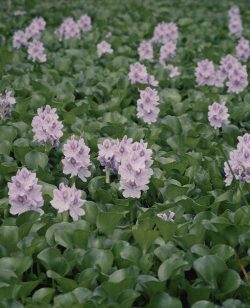 Water hyacinth is a great example: originally from South America, it produces chemicals that can inhibit the growth of aquatic plants and algae (its environmental competitors), allowing it to establish itself on every continent except Antarctica. Phenotypic plasticity refers to the way an organism changes in response to a new environment without changing its genes. High phenotypic plasticity increases a species’ ability to initially establish itself in a new place, and invasive species exhibit more plasticity than native species. There is a growing body of evidence suggesting that this plasticity allows for the greater persistence of invasive species due to their ability to respond to changes in their adopted environment better than native species. The strategies a plant employs during seed germination also give it an advantage. The shorter germination times and increased temperature tolerance of seedlings found among some invasive species offers them a broader range of locations where they can grow, and times when they can germinate compared to native species. Longer dormancy periods seen in invasive seeds allow them to be carried further and survive longer before beginning to grow. Not a bad strategy at all! Despite all of the research, there are no easy solutions to the problem of invasive species, and that means understanding these mechanisms isn’t enough to stop their spread. Thankfully there are things you can do! Put your unwanted plants in the garbage – avoid composting unwanted or invasive plants because this will give them an opportunity to spread. Clean your boots before hiking into a new area so you don’t accidently spread seeds. Do not take plants with you when travelling! Learn more and join the fight. 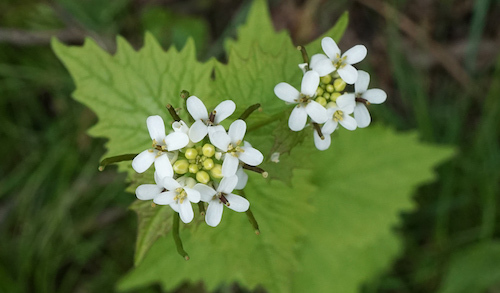 Ontario’s Invasive Species Awareness Program offers a myriad of programs to try and control invasive species in Ontario, which include landowner workshops and garlic mustard pulls. Similar programs can be found in many major cities in Canada! Donate to the Invasive Species Centre to help them with their campaigns against invasive species in Canada. Report invasive species sightings to the invasive species hotline (1-800-563-7711) so that proper steps can be taken to deal with the population. Not to mention, in many places (like Alberta), you are required by law to clean your boat thoroughly before transporting it to a different body of water in order to avoid aquatic plant transfer. Even if it isn’t the law in your area, you should take the time to try and protect our waterways. This post focuses on invasive plants but invasive animal species are also a huge problem in Canada—the emerald ash borer and zebra mussel were major contributors to Ontario passing the Invasive Species Act and Canada instituting the Aquatic Invasive Species Regulations. These invasive species present their own unique challenges. You can learn more about them through the Invasive Species Centre. Biology and Life Sciences, Communication, Education, and Outreach, Environmental and Earth Sciences, Science in Society Biology and Life Sciences, Canadian Food Inspection Agency, invasive species, Invasive Species Centre, Jenna Finlay. permalink.